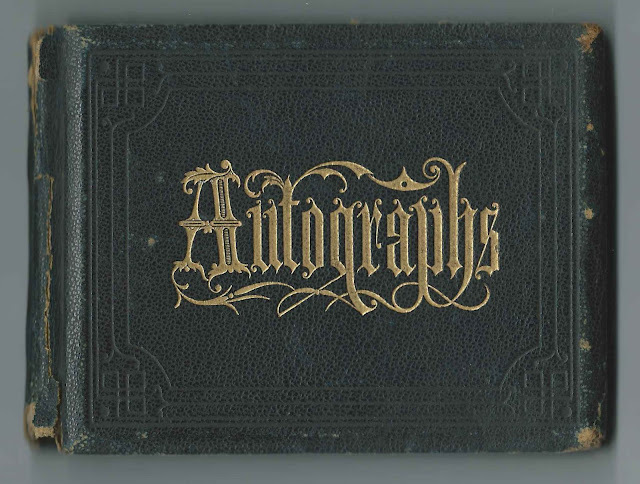 Autograph album that Ella E. (Hunt) Stover of Auburn, Maine, and, possibly, Biddeford, Maine, kept from 1873 through the 1880s, after her marriage to James T. Stover. 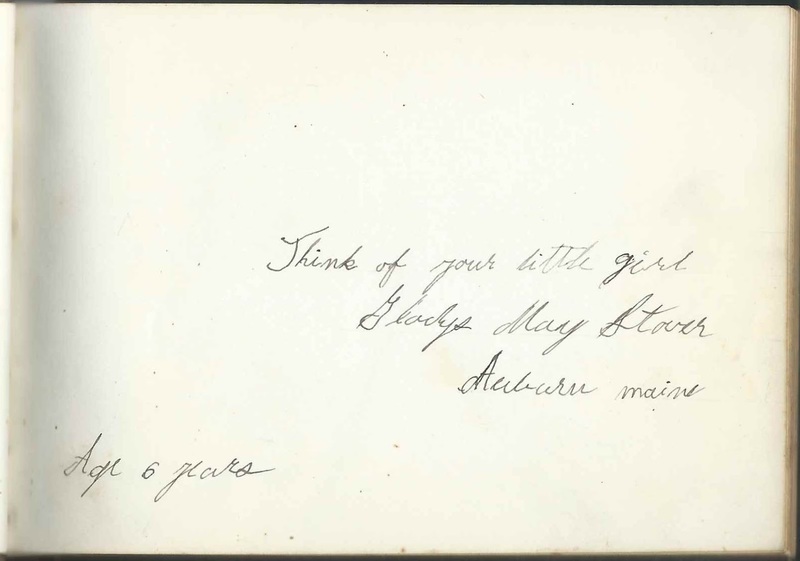 The album measures approximately 5-1/4" by 4" and contains the sentiments of 36 of Ella's relatives and friends from Maine and Massachusetts. It's possible that some pages, including any presentation page and title page, are missing. Ella Esther Hunt was born May 24, 1851 at Auburn or Lewiston, Maine, the daughter of Nahum L. Hunt and Hannah B. (Mitchell) Hunt. The 1860 Census of Auburn, Maine, shows that Ella then had two younger brothers, Charles and Franklin, and there may have been other siblings that I missed. Ella married James T. Stover of Harpswell, Maine, on December 24, 1870 at Auburn, Maine. The couple's daughter Gladys May Stover was born about 1875. 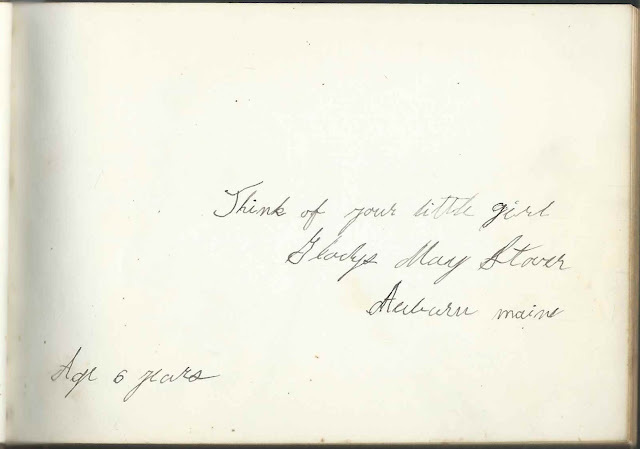 About 1881, when she was six years old, Gladys inscribed a page in her mother's album. Ella died on March 2, 1902. James subsequently married Susan E. Dunham. Ella Esther (Hunt) Stover, daughter Gladys May (Stover) Manser and Gladys' husband Harry Manser, are buried in the Mount Auburn Cemetery at Auburn, Maine. 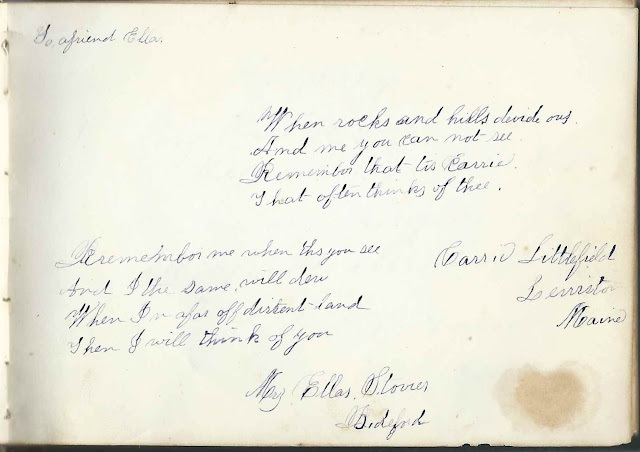 Although the Censuses show the Ella lived at Auburn, Maine, inscriber Carrie Littlefield of Lewiston, Maine, implied that Ella was living at Biddeford, Maine. Perhaps Ella was just visiting, or perhaps the Stover family did live at Biddeford for a while. Irving T. Ham of Fall River, Massachusetts; inscribed on 1882-6-8. His wife Pauline Spear (Webber) Ham inscribed the right facing page. Pauline Spear Ham of Fall River, Massachusetts; inscribed on June 8, 1882. She was Pauline Spear (Webber) Ham, whose husband Irving T. Ham inscribed the left facing page.